The Sport Clips Ultimate Race Fan Experience Sweepstakes is open to legal residents of the 50 United States and the District of Columbia who are at least 18 years of age. 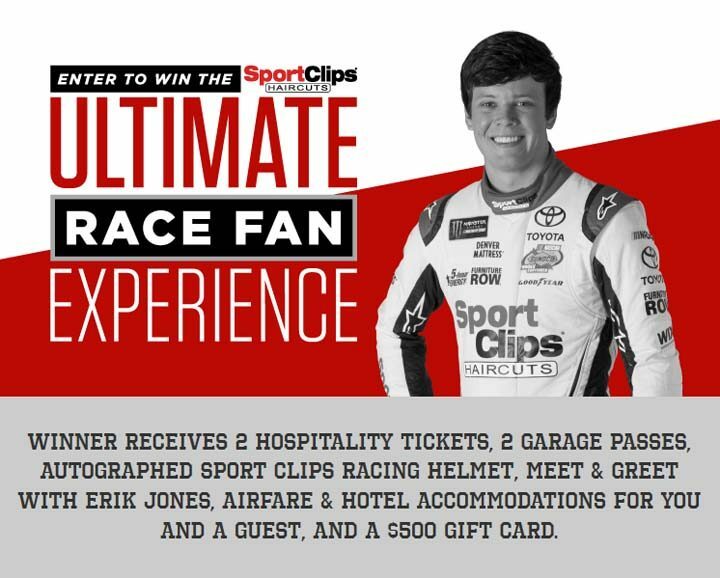 The Sport Clips Ultimate Race Fan Experience Sweepstakes ends at 5:00 P.M. ET February 1. To enter, visit sportclips.com/Vegas, then follow the site instructions to provide requested information and submit your entry. There is a limit of one (1) entry per person/email address, per day. One (1) Grand Prize will be made available, consisting of a trip to the Las Vegas, NV area for winner and one (1) guest, including: round trip coach air travel for winner and one (1) guest from the major gateway airport closest to winner’s residence; double occupancy (one  room) hotel accommodations for either one (1) night or two (2) nights as determined by Sponsor in its sole discretion; two (2) hospitality suite tickets to the 3/3 Monster Energy Series Race at Las Vegas, Nevada; two (2) garage passes; one (1) Sport Clips Racing helmet; a meet and greet for winner and one (1) guest with driver Erik Jones; a t-shirt and caps selected by Sponsor in its sole discretion; and one (1) $500 prepaid gift card, intended for to be used by the winner for ground transportation between the destination airport, hotel, and race. The total approximate retail value (“ARV”) of the Grand Prize is $3,640.